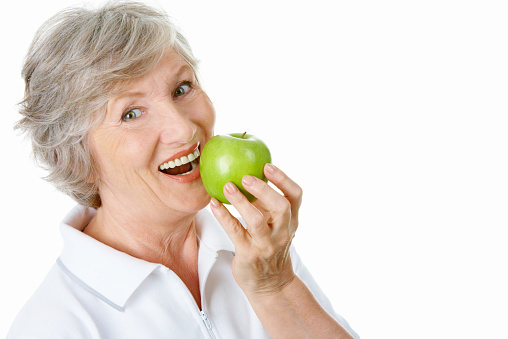 Apples: The Secret to Fall Prevention? Home » General Health » Apples: The Secret to Fall Prevention? It might be hard to imagine, but that old saying about eating an apple a day to keep the doctor away could be the health breakthrough of a lifetime. I know I’ve been hearing that saying—“an apple a day can keep the doctor away”—since I was a young child, and maybe you have too. I must admit, I never really believed it when I was younger. But as I’ve aged and started researching health, I now see how small changes can truly make a big difference to your health. And get this: a new study is showing how apples can prevent muscle breakdown commonly associated with aging. In your mid-to-late 30s, your muscles are in their prime. Unless you’ve been working out hard since then, you can bet your muscle mass has been decreasing since you hit the age of 40. It happens slowly, but by the time you’re in your late 60s—or in some cases even earlier—you might already be experiencing some of the problems associated with lost strength and muscle mass, including poor balance and a greater susceptibility to life-threatening falls. Losing muscle mass can expose you to some serious injuries, which is one of the reasons I’m always encouraging you to do resistance exercises. Stronger muscles can improve balance, prevent falls, protect your bones, and make life, in general, less risky. New research, however, has uncovered why muscle diminishes with age. Without getting too technical, a research team from the University of Iowa has discovered that a particular protein—ATF4—causes muscle loss with age. However, it appears ursolic acid (found in apples and green tomatoes) can reduce ATF4’s damage. Apple peels and green tomatoes are rich sources of ursolic acid, which appears to prevent muscle wasting caused by inactivity and age. This can have huge benefits for your health and quality of life. By adding an apple or green tomatoes to your diet, in addition to eating a high-protein diet, you can put forth your best effort to stay strong as you age. All of a sudden, carrying your groceries might not be as difficult and your risk of falling could be substantially slashed. Furthermore, it could delay the onset of conditions like sarcopenia and osteoporosis. Including an apple a day in your diet is pretty easy and can have some big health benefits, so give it a try! But before I sign off, it’s very important that I mention that the research conducted at the University of Iowa was done on mice. Human trials are still required, but the results look promising so far! “Keeping Older Muscles Strong,” ScienceDaily web site, September 8, 2015; http://www.sciencedaily.com/releases/2015/09/150908112442.htm.